The mercurial Judy returns - and she’s in a mood to take on the world! It all started with the Crazy-Strip contest - and the dream that she, Judy Moody, might one day see her very own adhesive-bandage design covering the scraped knees of thousands. But when her "Heal the World" motif merits only an honorable mention, Judy Moody realizes it’s time to set her sights on something bigger. Class 3T is studying the environment, and Judy is amazed to learn about the destruction of the rain forest, the endangered species (not) in her own backyard, and her own family’s crummy recycling habits. Now she’s in a mood to whip the planet into shape - or her name isn’t Judy Monarch Moody! Megan McDonald is the author of the award-winning JUDY MOODY and JUDY MOODY GETS FAMOUS! and numerous other books for children. After writing JUDY MOODY GETS FAMOUS!, she confessed, "Okay. I admit it. I am Judy Moody. Same-same! In my family of sisters, we’re famous for exaggeration. Judy Moody is me . . . exaggerated!" Megan McDonald lives with her husband, two dogs, two adopted horses, and fifteen wild turkeys who like to hang out on the back porch. Peter Reynolds is the illustrator of all three JUDY MOODY books. Of JUDY MOODY SAVES THE WORLD! he says, "Judy shows that she can channel her feisty energy to make the world a better place, and I hope this special book will inspire the next generation to 'save the world' too." This charming read features characteristically snappy, humorous prose; expressive, witty, black-and-white illustrations; and some great ideas for classroom or home projects. The engaging tale is a triumph for Judy and her creator. The funny book affirms that kids everywhere can make a difference. 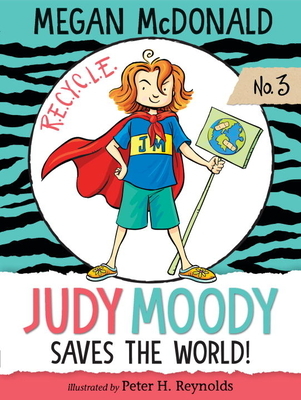 JUDY MOODY SAVES THE WORLD! is cleverly written, and its heroine is an appealing and very real third grader. Judy's growing corps of fans will crow 'Rare!' right along with her. With her deliciously quirky humor and her vivid characters, Megan McDonald gives her audience a wonderful reading experience. “ROAR!” for Judy Moody!